So we took the long-awaited family trip to the pumpkin patch!! William was decked out in his fall gear and we were beyond excited. There is an adorable patch down the street from our house and we were so looking forward to sharing it with him. Unfortunately, it was about a million degrees, even though we arrived after 5 so the experience was much less “fall like” than I had hoped. William was not a fan of the heat, but was a definite trooper through my seemingly endless desire for photos…86 to be exact. :0) He seemed to be absolutely fascinated by all of the pumpkins–loved looking at them up close. 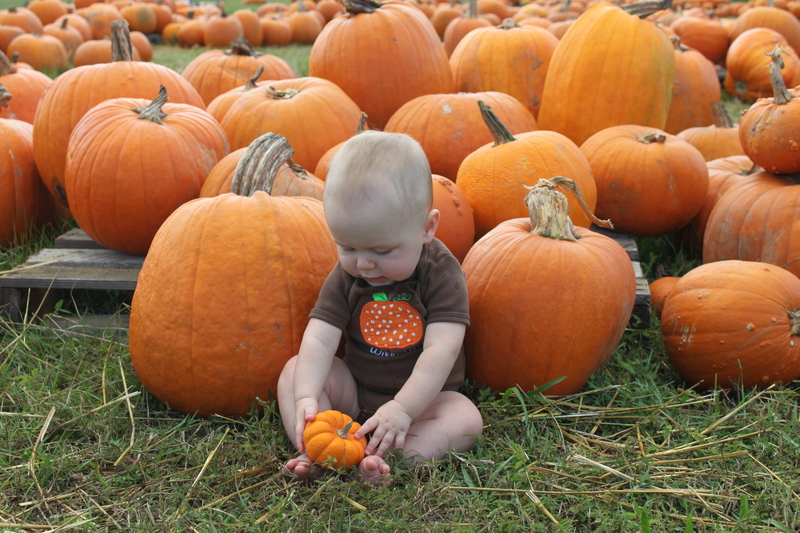 We ended up purchasing 15 pumpkins in all, including a precious little pumpkin for our little pumpkin! This gave such a taste of the excitement that is to come with holidays. What fun it will be to share all of the different traditions and festivities with him!! !